The Kingdom of Cambodia (pronounced /kæmˈboʊdiə/, formerly known as Kampuchea (/kæmpuːˈtʃiːə/), , transliterated: Preăh Réachéanachâkr Kâmpŭchea) is a country in South East Asia with a population of over 13 million people. The kingdom's capital and largest city is Phnom Penh. Cambodia is the successor state of the once powerful Hindu and Buddhist Khmer Empire, which ruled most of the Indochinese Peninsula between the eleventh and fourteenth centuries. 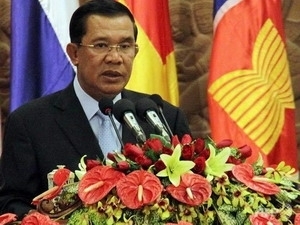 The politics of Cambodia formally take place, according to the nation's constitution of 1993, in the framework of a constitutional monarchy operated as a parliamentary representative democracy. The Prime Minister of Cambodia is the head of government, and of a pluriform multi-party system, while the king is the head of state. The Prime Minister is appointed by the King, on the advice and with the approval of the National Assembly; the Prime Minister and his or her ministerial appointees exercise executive power in government. Legislative power is vested in both the executive and the two chambers of parliament, the National Assembly of Cambodia and the Senate.